Connect your chat bot to your Facebook page. 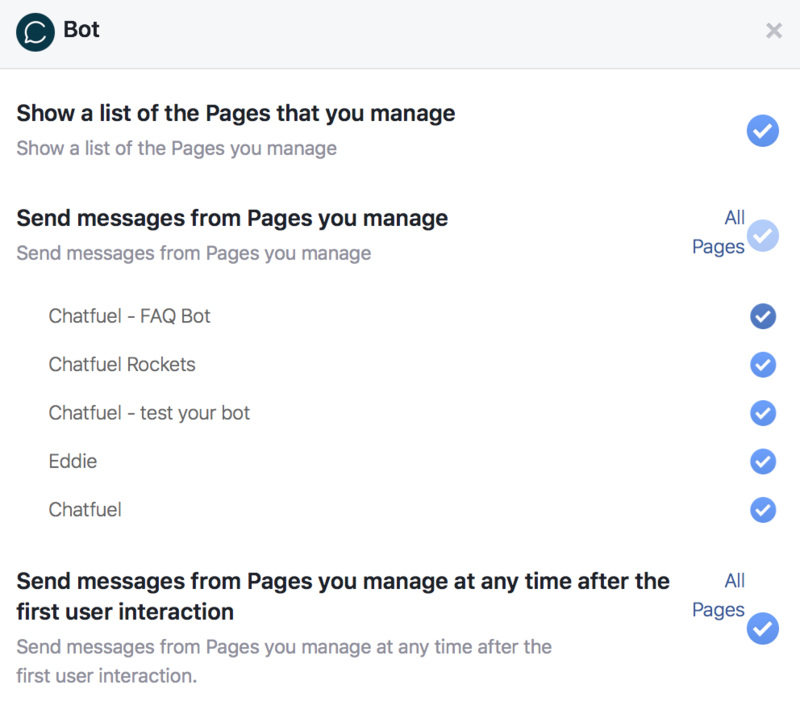 To publish your bot and make it go live, all you have to do is connect it to your Facebook Page in the Configure section of the dashboard. In the same section, you can also always disable your bot by disconnecting it or e.g. to connect a new version. If you for any reason get an error message or the bot is not working correctly after you have connected the page please make sure that you are an ADMIN of the Facebook Page you are trying connect, as page roles like editor or moderator don't have enough permissions to connect chat bots. If you are a page admin, please make sure that you have granted our app the sufficient permissions, which you can see on https://www.facebook.com/settings?tab=business_tools. We recommend setting it to All Pages so that you won't run into any issues regarding this in the future. We won't do anything without your request. If you decided to give permissions only for part of pages, please make sure you've given all four permissions to these pages. If you have any trouble with connecting your bot to the page, here's a more advanced troubleshooting guide.